The dog days of summer can be tough on your vegetables. Even heat-loving plants like tomatoes and peppers might need a little extra care during a heat wave. Here is how you can protect your garden and harvest during a heat wave. 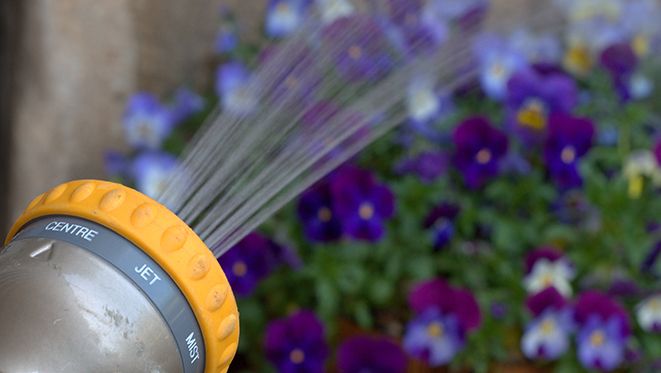 In the absence of rain, watering your vegetable garden early before the onset of heat can protect the plants. A well-watered soil will stay cooler than a dry soil. Also, soil that has been dried out by the sun does not absorb water well; the water will just run off. However, you need to make sure there is good drainage because waterlogging in a compacted, dense soil is especially damaging to the roots during warm weather, when they need more oxygen than in cold temperatures. Mulching with straw, other organic matter or unprinted cardboard helps retain moisture and slightly lowers the soil temperature. Black plastic mulch, however, does the opposite; it "cooks" the soil and should not be used. Plants that have received the proper amount of nutrients tolerate hot weather better and recover from wilt injury faster than plants grown in poor soil. That is because healthy vegetable plants have better resistance to heat than plants weakened by disease or insect damage. Generally fertilizer should always be applied before planting or early in the growth of a crop, but if you feel you must give your vegetable plants a little nutrient boost later in the growing season, and you want to add liquid fertilizer, make sure not to pour too much on or near the leaves as it can burn them. Of all the plants in your vegetable garden, the seedlings of fall crops such as broccoli, Brussels sprouts, cabbage, and cauliflower are the most susceptible to heat. They are best planted along a shade barrier or in the shade of other taller vegetables to protect them from direct hot sun, especially from the hot afternoon sun. A good investment if you want to grow lettuce and other leafy greens all through the summer is a shade cloth. It looks like black netting and comes in varying densities, which correspond to the percentage of blocked light. For most vegetables, a 30% to 50% shade cloth is recommended. Note that the shade cloth should not come in contact with the plants, otherwise the heat from the cloth can burn the plants, and the movement of the cloth in the wind can damage the plants. The shade cloth should be securely attached to poles. Another enemy of tender seedlings is hot summer wind, which will dry them out and break them. Place a windbreak in front of the seedlings to protect them from the prevailing wind. Bolting, the premature growth of a flower stalk, can occur in lettuce, leafy greens, beets, cabbage, and celery, and turns them bitter. While bolting is commonly associated with hot weather, it is triggered by changes in day length. To prevent this, plant slow-bolting or bolt-resistant varieties. Ensure good air circulation. In a vegetable garden that is planted too densely, disease can spread more easily, especially in hot humid weather. If your indeterminate tomato plants have turned into a thicket by mid-summer, it is best to sacrifice a few tomatoes and cut out some stems and foliage to increase air circulation. If you prune tomato plants, disinfect your tool after every plant (household bleach and water mixed in a 1:3 ratio), which helps prevent the spreading of disease that might be present in a plant. Harvesting during the cooler hours of the day is not just easier on the gardener but also on the produce. Strong midday sun can wilt or dry out your crops, so move them out of the sunlight and bring them to a cooler location as soon as possible. Ideally, the harvest should be washed immediately to cool it down to remove field heat. Placing your harvest on top of ice in a cooler box has the same effect.